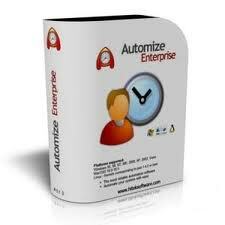 Automize is a task scheduler and automation program. Easy to use, No programming is required.This task scheduler and automation software can automate a variety of tasks, including FTP transfers, FTP monitoring, Web downloads, Web site monitoring, e-mail checking and sending, Telnet, ping, database SQL, advanced zip, unzip, copy, synchronize folders, and directory and file monitoring. In addition, the chaining feature can run tasks in sequence or conditionally depending on exit codes. Additional features include email notifications on task failure, FTP browsing, ZIP file viewer, extensive logging, remote task control and more. It supports dynamic variables to achieve advanced automation tasks. Email notification profiles based on exit code can be set for tasks.Schedules can be synchronized to allow or prevent overlapping schedules. Dynamic variables allow for advanced automation solutions. Number of command-line utilities are available to remotely and programmatically control tasks and the scheduler.The program is written in Java and therefore Multi-platform compatible. Automate and execute tasks as well as other software programs and applications. No programming or script knowledge is required. Dynamic variables are supported for most tasks. Most tasks also generate variables which can be used in other tasks. Create advanced automation solutions using our Automize tasks in conjunction with variables, directory/file monitors and our task chains. Chain Task Integrator includes Commands, database sql, check email, Ftp, Web downloads, send email, url spider downloads and monitors, telnet, ping, copy, print files etc.. Run multiple programs, commands, ftp, email, web downloads etc.. in sequence with options depending on Exit codes. Automate FTP to/from an intranet or internet server. Schedule ftp of files between your PC and the server and automatically rename the files based on current month, day or time if needed. Ftp supports wildcards Transfer multiple files at once. Supports Ftp logging and can be used as an Ftp daemon. Telnet can be automated. Run your Telnet commands on a schedule. The Advanced Telnet task can wait for your commands to finish (by detecting the telnet prompt); and then send the next telnet command. Automate Microsoft Office products: Schedule a MS Access, Excel, MS Word, PowerPoint macro or other commandline startup switch. You can also schedule an Access macro and compact or repair the database.